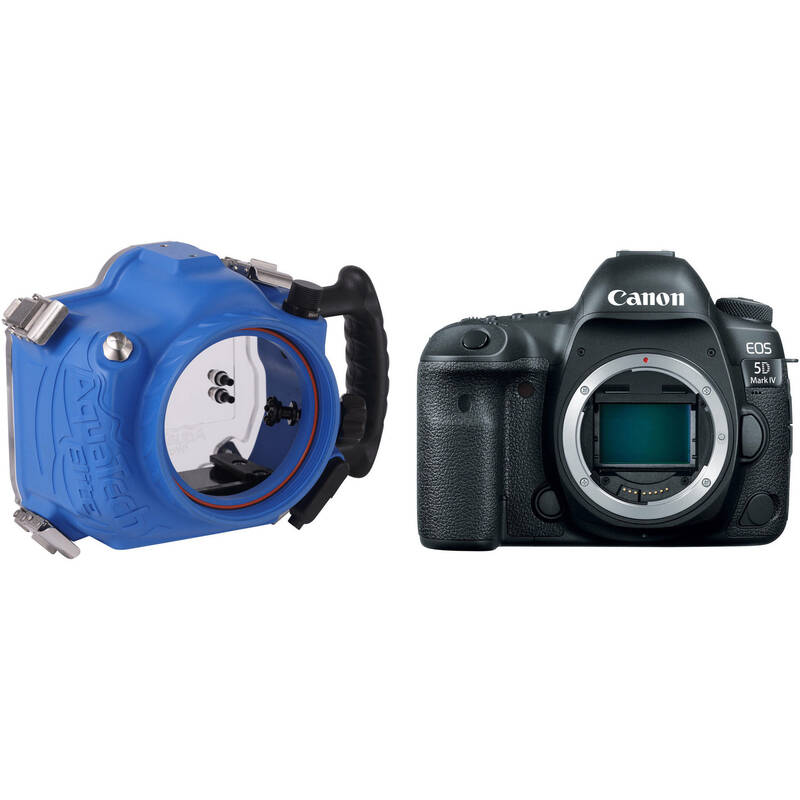 Capture 30.4MP photos and DCI 4K video beneath the surface with this AquaTech Elite 5D4 Underwater Camera Housing and Canon 5D Mark IV Camera Body Kit from B&H. The housing is depth-rated to 33 feet and provides mechanical control of the camera's functions. The camera's 30.4MP full-frame CMOS sensor pairs with the DIGIC 6+ image processor to balance fine detail and resolution with low-light performance and sensitivity, with an expanded ISO range of 50-102400. Once you grab your favorite lens, the appropriate port, and a strobe or video light, you'll be ready to start your dive. Capture photos and video over, under, on, or near the water's surface with your Canon 5D Mark IV DSLR camera in AquaTech's Elite 5D4 Camera Water Housing. Featuring a depth rating of 33', it is designed for shallow water and surface use and shouldn't be operated at depths beyond 15' for longer than 5 minutes. The Elite's tactile, mechanical controls provide easy access to important camera functions, and its ergonomic design and side grip afford optimal handling and comfort. An optional Pistol Grip Trigger and Pole Shutter Extension kit offer the ability to adjust focus and capture images with your hands off the housing, allowing for sharp, blur-free images. The pole enables remote firing and affords extra reach when shooting at certain angles. The housing's polyurethane body has reinforced quick release clips and tactile controls made of stainless steel, aluminum, and high-strength plastics. All the aluminum parts have been anodized for resistance to corrosion and other wear and tear. An optional flash bulkhead sync connector, supplied with the AquaTech flash housings, enables the Elite 5D4 to work with optional accessories such as external flash units and pocket wizards. A threaded 3/8"-16 mounting point at the bottom of the housing enables connection to an optional tripod or tray. The enclosure ships without a required lens port and accepts a series of ports for a wide range of lenses. For complete compatibility information, see the Port Chart.